Ever since BMW Motorrad presented the concept study Concept 6 in autumn 2009, the new 6-cylinder in-line engine installed in it has caught the imagination of many motorcycle fans. For over seven decades now, 6-cylinder in-line engines have stood for fascinating engine technology in automobiles at BMW more than with any other brand. With the new K 1600 GT and K 1600 GTL, BMW motorcycles are now available for the first time with a 6-cylinder in-line power unit developed in-house. The two touring motorcycles have a supreme, impressive and equally distinctive appearance, creating a desire to travel at first sight. Riding dynamics, long-distance suitability and comfort. For decades, 6-cylinder in-line engines have exercised a special fascination. In addition to their perfect running smoothness they also offer supreme output and torque, giving the rider powerful emotional impressions. In addition to safety, equipment and comfort, prestige and dynamic performance are the key criteria for a supreme touring bike. With the most compact in-line 6-cylinder engine in serial motorcycle production to date, the K 1600 GT and the K 1600 GTL penetrate a whole new dimension in terms of riding properties, long-distance suitability and comfort. They combine maximum agility and riding dynamics with a luxurious overall package. With an engine output of 118 kW (160 bhp) and a maximum torque of 175 Newton metres, their 6-cylinder engine provides superb propulsion in all conditions. Lightest and most compact serial production 6-cylinder in-line engine in a motorcycle > 1000 cc. Previously, the in-line arrangement of six cylinders resulted in either very long or very wide constructions, depending on the installation position, which led to drawbacks in terms of chassis geometry, weight distribution and centre of gravity. This where the K 1600 GT and K 1600 GTL break new ground. Weighing 102.6 kilograms, the engine is by far the lightest serially produced 6-cylinder in-line engine for motorcycles in the class > 1000 cc. What is more, the engine is significantly narrower in construction width than all other 6-cylinder in-line motorcycles in serial production to date. This extremely compact construction and reduced width was achieved in particular by means of a cylinder bore of 72 millimetres in conjunction with a spacing of just 5 millimetres between the cylinder the cylinder sleeves. Both the low engine weight and the consistent lightweight construction of the vehicle as a whole contribute to the low weight of the vehicle. At 319 kg (K 1600 GT without panniers) and 348 kg (K 1600 GTL with panniers and topcase) the new touring bikes are in the lower range of the segment. Three modes to choose from and DTC (Dynamic Traction Control) for maximum safety when accelerating. 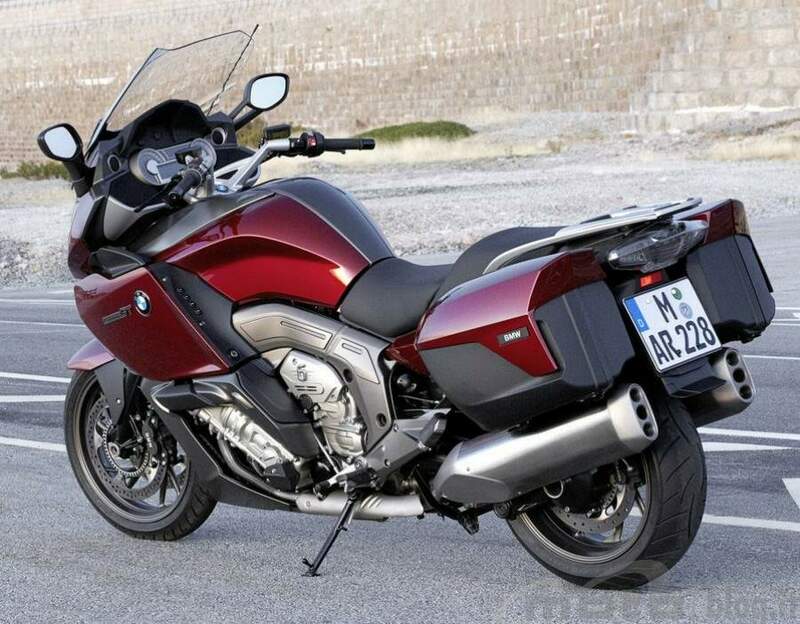 The rider of the K 1600 models has three different engine characteristics directly available at the press of a button at the right-hand end of the handlebars so as to be able to adapt to different uses such as touring on the road, riding on wet surfaces and sporty, dynamic motorcycling - the modes "Rain", "Road" and "Dynamic". Available as an option ex works, the traction control function DTC is combined individually with the different modes, fully harmonised with them so as to provide maximum riding safety. The control of the central throttle valve with a diameter of 52 millimetres is effected via an e-gas, also known as a ride-by-wire system. The rider's wishes are registered by means of a sensor in the accelerator twist grip. The engine control then adjusts the position of the throttle valve accordingly. Chassis with ideal mass concentration for dynamic riding properties. 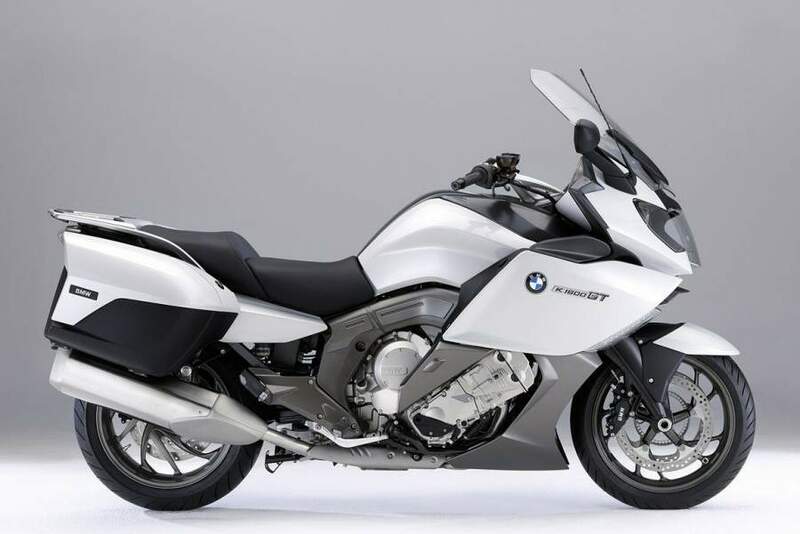 The essential chassis elements of the BMW K 1600 GT and K 1600 GTL are the light alloy bridge-type frame, and the Duolever and Paralever for wheel control at front and rear. Because of the special requirements of a touring bike with a 6-cylinder engine, particular attention was paid to balancing the masses. All in all, the interplay of chassis and engine position, together with the seating position of the rider, not only makes for a low overall centre of gravity with a very favourable concentration of masses, it also provides an ideally balanced wheel load distribution for excellent riding properties. The combination of ride stability, riding dynamics and lightness of handling in all riding and load conditions sets a new benchmark in the touring bike segment. Electronic Suspension Adjustment ESA II for optimum adaptation to all uses and load states. The new 6-cylinder touring bikes also benefit from the innovative Electronic Suspension Adjustment II (ESA II), which is offered as a special equipment feature ex works. With this system, globally unique on the motorcycle market, the rider can conveniently press a button to electronically adapt not only the rebound damping properties of the front and rear spring strut but also the spring rest ("spring preload") of the rear spring strut as well as the latter's spring rate and therefore the "hardness" of the suspension. This makes for outstanding stability and impressive responsiveness in all load states. The additional adaptation of the spring rate allows the damping settings "Sport, Normal, Comfort" to be spread widely in ESA II, giving them clearly perceptible characteristics during riding. So in "Sport" mode, the K 1600 GT and K 1600 GTL are even more dynamic and precise and in "Comfort" mode they are more comfortable - while still retaining excellent stability. Adaptive headlight - a world first for increased safety at night. With the new BMW Motorrad touring bikes, the first ever "Adaptive Headlight" option is available ex works in the motorcycle sector as a supplement to the standard xenon headlamp. In addition to standard pitch compensation, the light of the main headlamp is also balanced in relation to banking angle. This produces significantly improved illumination of the road when cornering and therefore an enormous increase in active riding safety. Integrated operating concept with Multi-Controller, TFT colour screen and menu guidance. The instrument panel of the K 1600 models comprises two classic circular instruments for the speedometer and tachometer and a 5.7-inch TFT colour display. The design of the information display is also completely new in the motorcycle field. Among other things, it enables the attractive presentation of text and graphics over several lines. Another world first is the Multi-Controller as part of an integrated operating concept, first introduced in the BMW R 1200 RT at the end of 2009. In addition to audio system control, the K 1600 models also have a menu for operating the comfort functions and on-board computer. Innovative design with outstanding wind and weather protection. Particular attention was paid during development to the combination of innovative design, optimum wind and weather protection and the very highest level of functionality. A very good example of this is the electrically adjustable windshield with memory function. The bike's aerodynamic qualities in terms of reduced air swirl - especially in the pillion passenger area - were developed in sophisticated wind tunnel tests. But the windshield not only protects the rider and pillion passenger: it automatically returns to the starting position when the ignition is switched off, acting as an anti-theft system for the optionally available navigation system. BMW K 1600 GT with active riding ergonomics for proactive touring. The design of the ergonomic triangle from the position of the footrests, seat top and handlebars makes for a highly proactive seating position in the K 1600 GT, while still retaining a high level of long-distance comfort. The rider and pillion passenger enjoy a comfortable knee angle but the seating position is geared towards the front wheel for a dynamic riding style. The seat is height-adjustable in the rider area so that it can be adapted to individual needs. The K 1600 GT is has a very extensive range of standard features ex works consisting of xenon headlamps, heated grips and seat, cruise control and on-board computer. 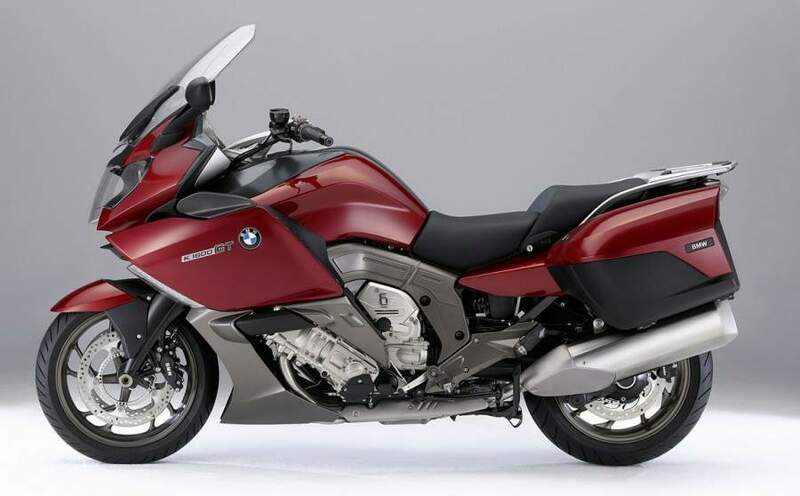 In conjunction with the supreme riding qualities of the new BMW Motorrad 6-cylinder engine, this motorcycle leaves nothing to be desired as far as the proactive touring rider is concerned. BMW K 1600 GTL with very comfortable, relaxed ergonomics set-up for long trips with pillion passenger. 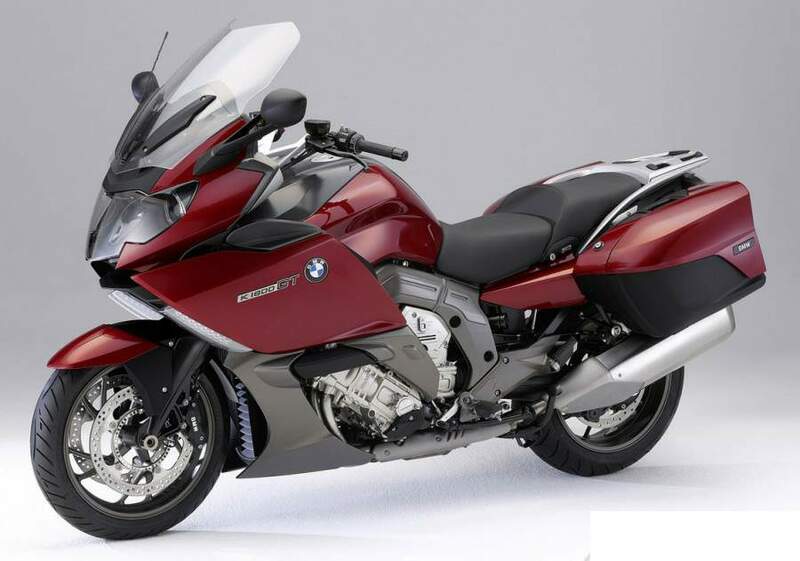 The luxurious touring bike BMW K 1600 GTL meets the very highest demands. Rider and pillion passenger benefit from the very relaxed, upright seating position as is especially appreciated over long distances. The ergonomic design is geared towards maximum comfort and derives from a single-section, dual level seat in conjunction with rider footrests which are further forward and lower, as well as handlebars which reach further backWards. The standard topcase rounds off the range of comfort features for the pillion passenger. Like the K 1600 GT, the K 1600 GTL has a very extensive range of standard features consisting of xenon headlamps, heated grips and seat, cruise control and on-board computer. 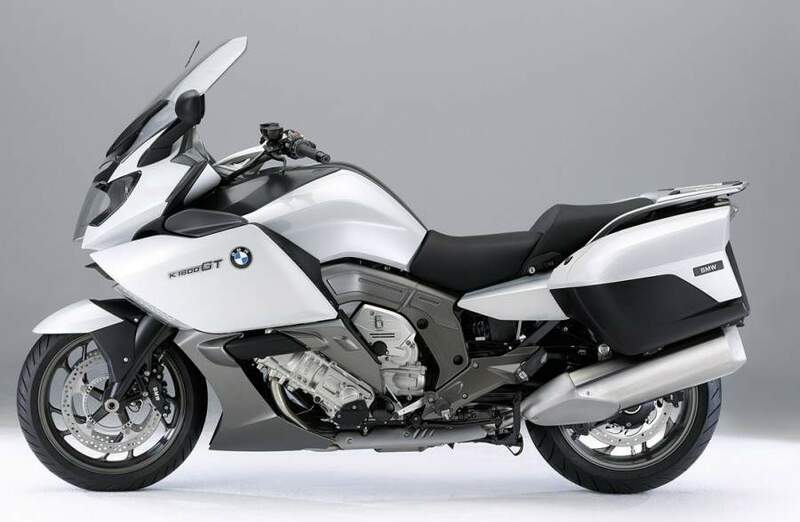 The overall impression of the fascinating 6-cylinder motorcycle in combination with a carefully conceived storage concept, a standard audio system and numerous design elements make the BMW K 1600 GTL the flagship model among the BMW Motorrad touring bikes. Individual paint finish concepts adapted to the character of each bike. As touring bikes, the new BMW K 1600 GT and K 1600 GTL stand for a perfect synthesis of supremacy, dynamic performance and comfort. This is also reflected in the colouring of the two models. In the K 1600 GT, the body colours of Light Grey metallic and Vermilion Red metallic create a fascinating contrast with the frame and wheels in Ostra Grey and the engine in Platinum metallic matt. The colouring especially highlights the bike's technical components. The lines are concentrated and give the motorcycle a marked sense of agility. With its emphasis on comfort and equipment, the K 1600 GTL has a powerful presence and elegance with elongated lines. This was achieved by means of a harmonious interaction between body colours and the colouring of the engine and chassis components. Here, Mineral Silver metallic or Royal Blue metallic 2 provide a perfect match for the Magnesium metallic matt of the painted frame and wheels. The engine in Platinum metallic matt ensures an appealing overall impression. * Supreme in-line 6-cylinder engine with a high level of pulling power, especially in the lower and medium engine speed range. * Engine output 118 kW (160 bhp) at 7 750 rpm and maximum torque 175 Nm at 5 250 rpm. * Over 70 per cent of the maximum torque is already available from 1 500 rpm. * The lightest and most compact 6-cylinder in-line engine in serial motorcycle production > 1000 cc weighing just 102.6 kg and measuring 555 mm in width. * Consistent lightweight construction throughout the entire vehicle (magnesium front panel carrier, aluminium rear frame, crankshaft etc.). * High active safety due to standard BMW Motorrad Integral ABS (part integral). * Dynamic traction control DTC (Dynamic Traction Control) for maximum safety when accelerating (optional extra). * Chassis with Duolever and Paralever and ideal mass concentration for dynamic riding properties combined with optimum comfort. * Electronic Suspension Adjustment ESA II for optimum adaptation to all uses and load states (optional extra). * World premiere in a motorcycle: Adaptive Headlight (optional extra) for increased safety at night in conjunction with standard xenon headlamp and fibre optic rings. * Integrated operating concept with Multi-Controller, TFT colour display and menu guidance for the first time. * Audio system with preparation for navigation device and controllable interface for iPod, MP3, USB, Bluetooth and satellite radio (USA and Canada only) (standard in the K 1600 GTL). * Innovative design with outstanding wind and weather protection. * K 1600 GT with active riding ergonomics for proactive touring. * K 1600 GTL with a very comfortable, relaxed ergonomics set-up for long trips with pillion passenger as well as luxurious touring equipment. * Central locking for storage compartments, panniers and topcase (optional extra). * Extensive fittings and individually tailored accessories at the familiar high level of BMW Motorrad.